I’ve already written about and given a few talks on workflow including some of the ideas and methods that directly came out of my work, but I still haven’t written about the actual changes we made and how they were implemented. While we may be getting less of it compared to years ago, the library still processes and catalogues thousands of physical items a year. I’m not sure how systematically the workflow had ever really been reviewed, so I wanted to make sure to take a holistic approach including everyone in the department as well as some work happening outside of it. In a previous blog post, I explained what Technical Services is along with a rationale for reviewing and revising the workflow. 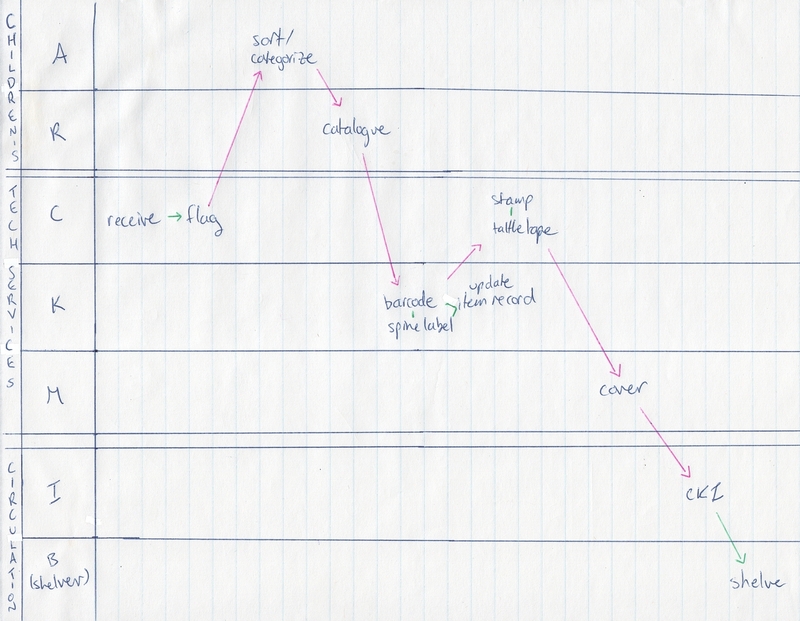 I also wrote about the process, plan, and implementation, but in fairly general terms. This post focuses more on the specific situation at the library where the review happened. Spine Label Printer (instead of label sheets; later we even got it networked!). 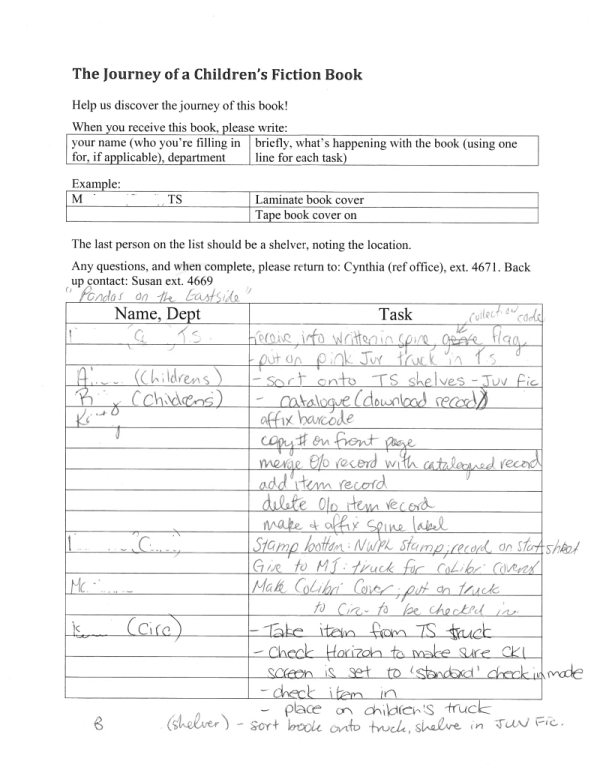 On Order/Brief Record Loading (instead of manually typing them). Use of Software to Search for Existing Cataloguing Records (BookWhere; the system allowed this but only one library at a time instead of searching on multiple libraries at once). Use of Macros/Tasks (in BookWhere/MarcEdit) to Automate Repeated Edits. Non-Fiction Call Number Simplication: Using the author’s last name and the year in lieu of Cutter numbers. Improved Import Profiles to Decrease the Likelihood of Errors. Began Running Priority List for Items Requested after Material Arrives. Items that have requests on them are flagged upon arrival and put in a priority queue. However, one of the things we struggled with was identifying items that were requested after they arrived in the building. Due to the backlog, sometimes an item would sit on the shelf for some time while we were working on the flagged items. That meant someone could request an item while in the backlog, but we wouldn’t know. To deal with this issue, we added a priority list. 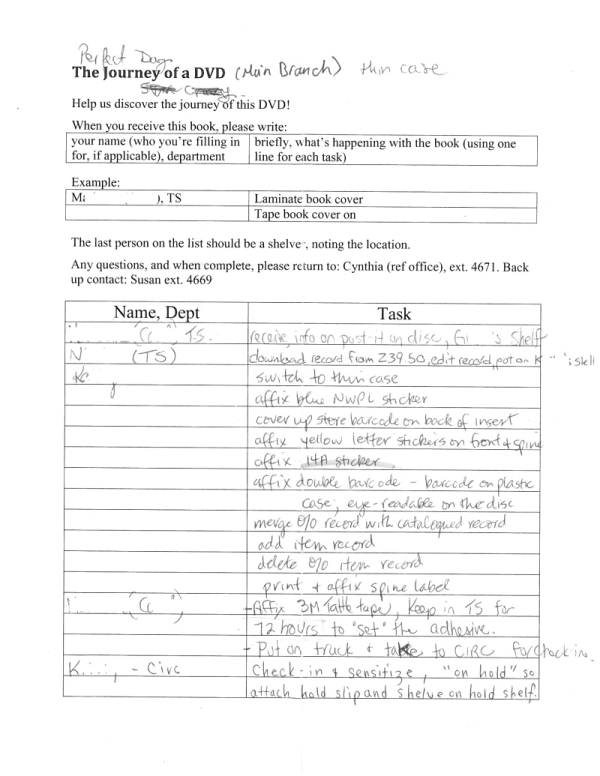 (Thanks to the staff at Burnaby Public Library who shared how they implemented and use their “rush” lists.) Originally, the list was run once a week, but staff decided to pull the list daily. Items on the list would be pulled, flagged, and moved to the priority queue. 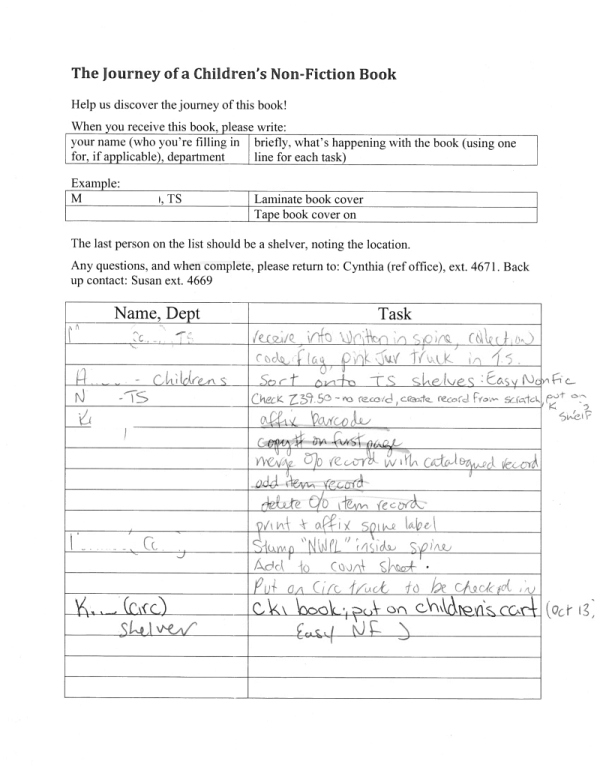 For the priority list to work, we also started changing the status of items when they arrived to “In Cataloguing” so that the system could tell which items were requested after arriving in the building. We also reorganized how the non-fiction not-priority books were shelved. To make the items easier to find, we started organizing by date and vendor. (Apologies for the lack of picture.) Staff used empty DVD cases with a slip of paper with the date and vendor written on it showing on the spine to separate the items. 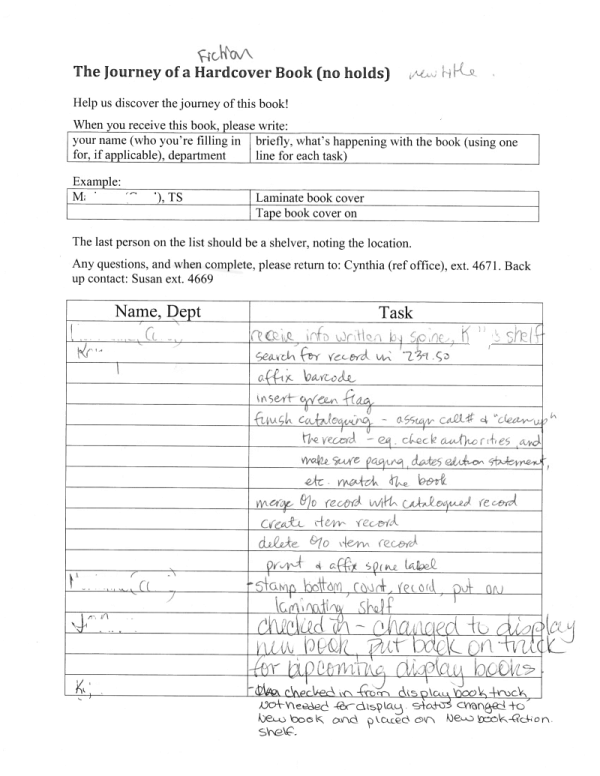 This method of dividing items was later extended to other areas by week, by month, or by quarter so that we knew which items were the oldest, which we prioritized after flagged items. It also helped with showing staff from other departments that we were being fair in how we prioritized items and how far behind we were (or not). I won’t go into too much detail about the exact process of the existing workflow, since I have talked about some of the methods I used to review the workflow before, and the rationale and benefits of a TS Review. centralize TS work to TS. While I drafted a proposed workflow as part of a plan, there were some revisions, though nothing ended up drastically different. LA = Library Assistant, so different staff are denoted by their position. LA2 FT did a number of steps (including tattle tapping) near the end, after the LA3 was done. 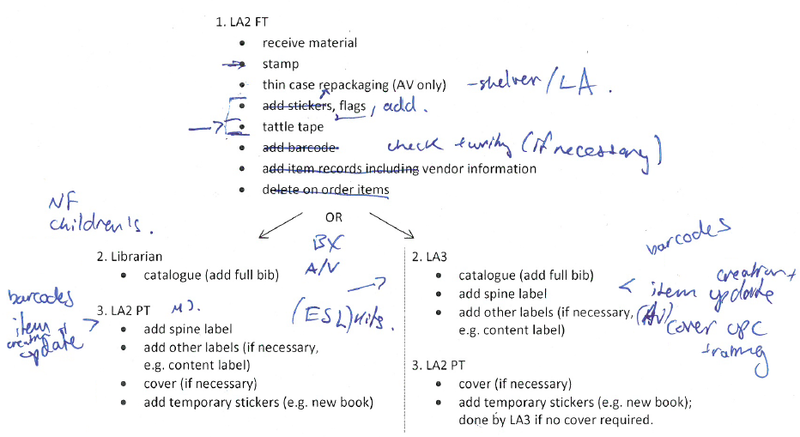 Adding the left side of the workflow, where the LA2 PT does everything the LA3 would do if a book is catalogued by someone aside from the LA3. Although it may not be obvious, the workflow is much more streamlined than the original, especially in cases where the LA2 FT did part 1, the LA3 did part 2, and part 3 isn’t necessary. As a results, most items will go through 3 people, sometimes only 2, but there should be no situation with 4+ people for a single item. 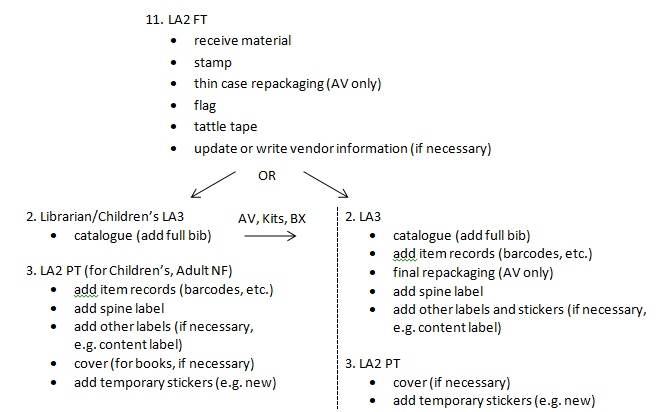 One of the complications was the number of smaller steps needed when Audio-Visual (AV) material (CD, Audiobooks, DVD) are processed and often repackaged, because some of the steps you cannot do until after cataloguing. 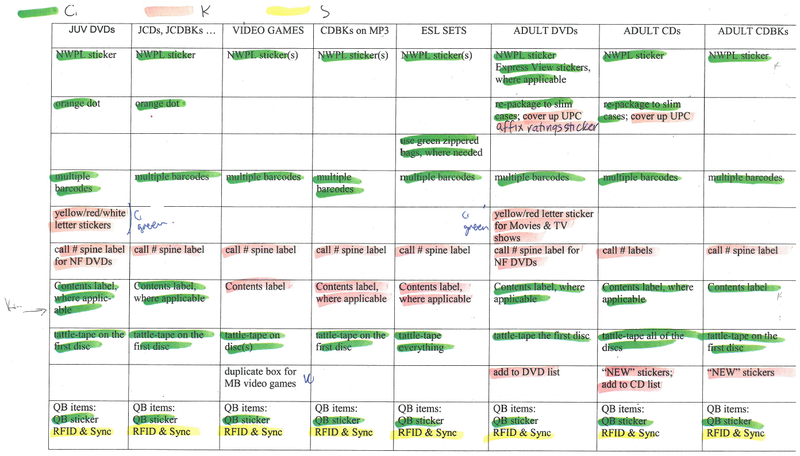 One of my staff members broke it down for us and marked up which steps could be done before cataloguing (green) and which had to be done after (pink and yellow), though as the pen markings reveal, we did some revision afterwards. Every month, we moved one or two tasks from the LA3 to each LA2 with flexibility to ensure that they were comfortable with the new tasks before introducing more. 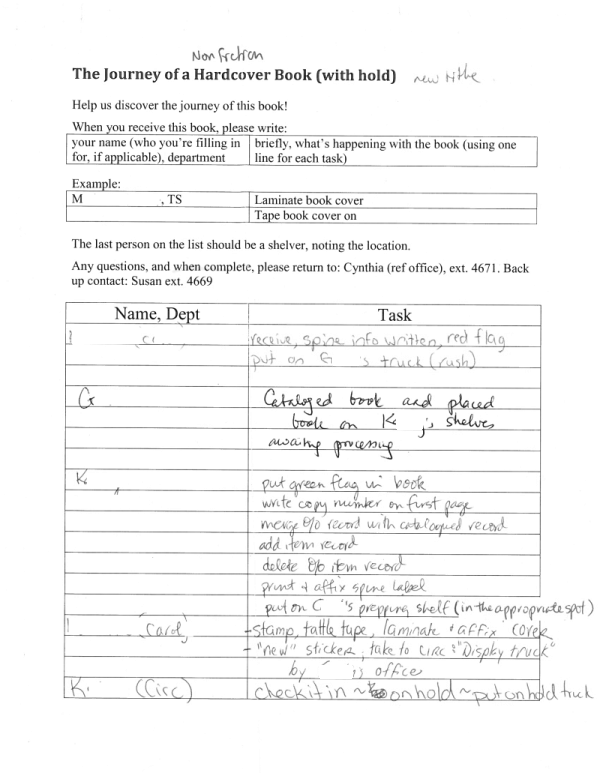 Some tasks had to be transferred as a group since for example, spine labels and other labels are always done right after updating item records. We did adjust the timeline since sometimes we had no items to do training with, or staff were already familiar with new duties (if they were backup or helped with projects) and they were simply becoming the primary person. 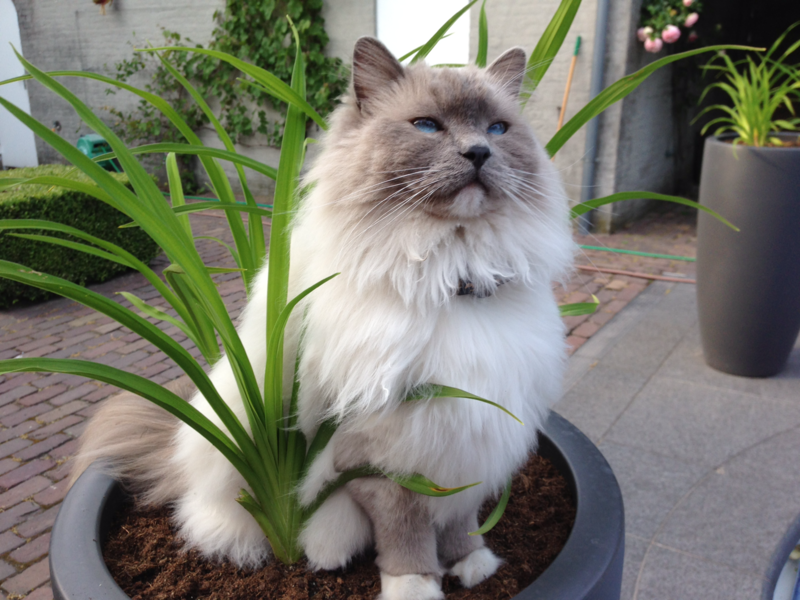 Nevertheless, staff were reassured that they would have time to get used to duties before more were added. I mentioned one of the goals of the plan was to centralize TS work. That’s not reflected here, because it focuses more on revising the existing workflow. It was mentioned on the plan for staff that the new distribution of work was partially because we were also going to move periodicals (magazines, newspapers) processing to TS, primarily to the LA2 FT staff member. I’m not going to actually write about that project, because it mostly involved planning who, where, and when with minimal changes to the process itself. As part of the process, review sessions were scheduled for individual staff and in groups, focusing in turn on how each person was doing with the changes in work, and whether anything needed to be adjusted in the new workflow. I also took the opportunity to do a cataloguing review session with staff who catalogued, partially to ensure everyone was on the same page about expectations and guidelines, but also to answer any questions on either guidelines or the new software. If nothing else, it forced me to sit down and update the cataloguing guidelines to reflect the current practices, and ensure we had what documentation we needed. 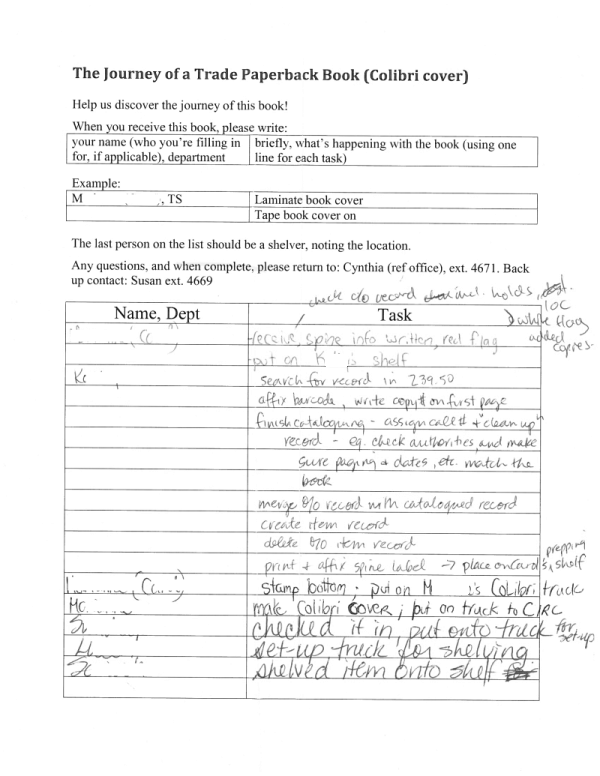 While it took a long time to do (especially when you factor in the visits to other libraries, information collection, and other aspects not explicitly mentioned here), the review and revision was definitely worth completing, planning, and implementing. We resolved a number of concerns, got the department more organized, and most importantly, provide better service as a result. The next problem to solve is what are staff to do when there are no items to process and catalogue!